European Oak is widely considered to be the finest available worldwide due to it’s attractive colouring, figuring and durability properties. All FinOAK Unfinished flooring is FSC approved and originates from the same highest quality raw material, making grade selection purely an aesthetic preference. Rustic Grade – Visible knots have been filled and sanded to complement the natural figuring and colour of the boards. This is the perfect choice if you are looking for some character. Clear Grade – Clean, contemporary and incredibly stylish. Each board has been carefully selected to ensure that the beautiful figuring of the wood is highlighted but no knots are present. Finfloor’s FinOAK Unfinished Flooring is commonly referred to as “untreated”, “unfinished” or “natural” flooring and the name suggests, requires finishing on-site, giving you complete control over the look and finish of your floor. Having been machined, the surfaces of the boards are left in their raw state and therefore require a coating before being exposed to foot traffic. Which finish does Finfloor recommend? We recommend finishing your unfinished floor with Monocoat or Oleum. Doing so will provide long-lasting protection whilst increasing the floor’s durability and stain-repelling properties. Due to the depth of penetration achieved, Monocoat and Oleum-Oil preserves the character and appearance of the wood and ensures that your floor is easy to clean and requires minimal maintenance. What is the difference between smooth and brushed? Surface texture of a hardwood floor can add a lot to the atmosphere for a particular room. It can accentuate the elegance or add to the warmth of a more casual setting. There are two surface textures available when it comes to FinOAK engineered wooden flooring. Smooth – A very delicate sanding gives wood a silky texture with classic allure while highlighting the grain. Smooth is a timeless texture that is still the most popular in hardwood flooring. Brushed – The wire brushing process is just as it sounds; the finish is lightly scraped with a wire brush, creating long and linear strokes. 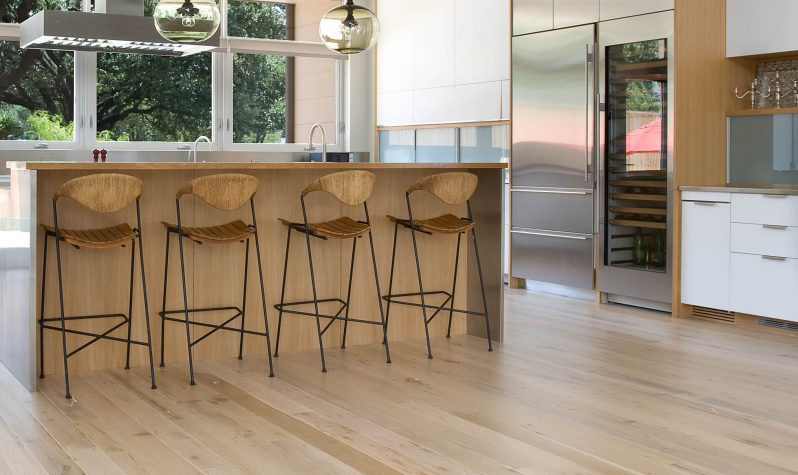 This brushed texture really accentuates linear grain patterns, like that of oak flooring and it makes a hardwood floor a little bit more interesting than if it had just a smooth surface. How are the 3-layer, HDF and Multi-ply Flooring being made? 3-ply Core Engineered wood flooring is constructed with grains running in different directions, this reduces the natural swelling and shrinking of the wood. The Surface layer is 3mm of Premium European Oak, with 10mm cross structure softwood pine and 1mm Poplar Back face to achieve both Economy and Stability for the Engineered Flooring. Multi-ply core Engineered wood flooring is made up with 3mm Hardwood veneer + 10mm quality plywood structure. The plywood is cross-layered, glued and pressed together, incorporating the Valinge click systems. And a 1mm pine back layer with the same grain direction to the Hardwood veneer. HDF-core Engineered wood flooring is made of essentially wood waste and makes a much heavier but highly stable and formable substrate with strong edges.The 2mm European Oak Rustic brushed top face is laminated onto the 7mm HDF (High Density Fibreboard) core and mounted onto a 1mm pine core backer for greater dimensional stability. How do I choose the right floor? Your budget. Generally speaking, the thinner board and the thinner the top face, the cheaper the product will be.With both 3-ply and multi-ply options, the thicker the board, the more stable your floor is likely to be, but in places where your subfloor is dry and level, you should be able to get away with a thinner board, which will cost you less. The environment. All FinOAK engineered planks use less precious Oak flooring than solid oak flooring and is therefore a better choice for the environment. All FinOak products are FSC certified so you can be sure that products come from responsibly managed forests that provide environmental, social and economic benefits. The conditions. When you are deciding between HDF, 3-ply and multi-ply engineered wood flooring, it’s important to consider the conditions in your room, as well as the moisture content of the sub floor.A HDF board is more likely to risk damage through moisture and temperature fluctuations than a 3-ply or multi-ply board. When choosing the right flooring for your job, there are many factors to consider, but they usually all come back to the composition and construction of the core.Ask questions of your supplier to understand where and how the flooring is manufactured so you can decide what will work best.If you are armed with some basics about core behavior you are well on your way to picking the right product for your job. For more information call 0860 346 356.